We all love weddings. Everyone in their own unique way, but those who were involved into the preparation of the event know that it just might be better when your only task is to show up, rather than to be responsible for too many things that go wrong sooner or later anyway. Well, in Wedding Salon, you get a lot of the busy scenatio. Holly manages the salons all over the country whole planning her own wedding. But it will be a different kind of busy, not like when you play with Flo and Quinn. 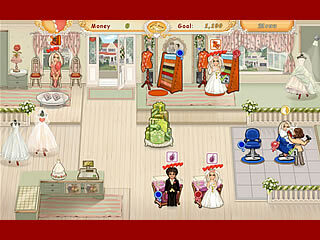 This time your main character is rather attached to the wedding salons, than to the weddings from start to end. But you realize that it doesn't mean that it is going to be less crazy, don't you? Holly manages the salons all over the country whole planning her own wedding. So you can expect a lot of traveling to different places which are ten in total. All of that makes up 70 levels that might take you three to four hours to complete. There is no special timed or endless mode for the more experienced gamers, but you can strive for the expert points that then go to Holly's own wedding. Since that feature allows you to choose different items for Holly's wedding, it keeps you wanting to get more expert points and get back to that. 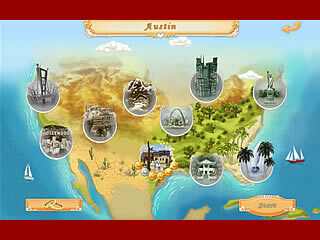 As to the main game play, it is very similar to that of the games about spa salons and diners. The customers enter the salon, and you are to drag them to a station according to what is in their thought bubble. Many stations include mini-games that you play along the way. Those are mainly about choosing the appropriate earrings or cake or whatever else. But you might not need to play the mini-games if you treated three persons of the same gender at one station. It is another way of rewarding the chaining. There are no bright characters among the customers that drop by, which is a bit boring. There is a difference between the age groups in how they treat the process. The graphics are good, but there is nothing peculiar about them. The game doesn't really offer anything really bright to make you want to replay it, but i guess, it may depend on the taste of the gamer. The trial version of the game is always a good thing when you consider buying a game. This is Wedding Salon review. Download this game here.